Northern Gannet: Very large seabird. White overall with black primaries and long pointed wings. Light yellow wash on crown of head extending down nape may be visible. Bill, legs, and feet are gray. Dives for fish and squid. Alternates rapid wing beats with short glides. Soars to great heights. Northern Gannet: Pelagic species found on the Atlantic coast. Often seen from shore, also may be found far from shore in open ocean. Breeds on coasts of north eastern Canada. Winters from Maine to Texas-Mexico border along Atlantic and Gulf coasts. The Northern Gannet has also been called solan, solan goose, and solant bird. 68% of the world population breeds around the coasts of Great Britain, with the largest colonies on the Bass Rock (whence the species' Latin name) and Boreray, St Kilda. A group of gannets has many collective nouns, including a "company", "gannetry", "newspaper syndicate", and "plunging" of gannets. 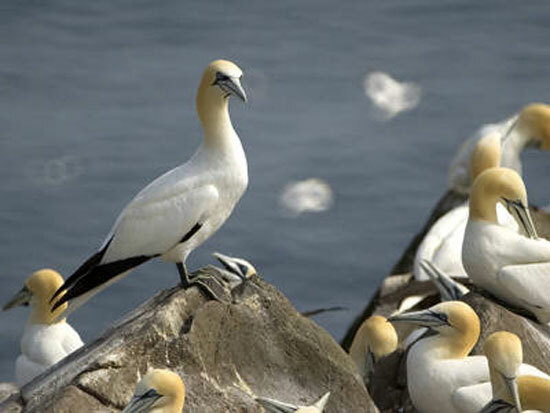 Inhabitants of the town of Ness of the Isle of Lewis are allowed to kill up to 2,000 gannets (locally known as guga) annually to serve as a traditional local delicacy - the taste is described as fishy.